A contemporary look at the Israeli media landscape. This blog post will give a brief overview of Israel/Palestine, their relevant history, systems of government, general socio-political status, and other main topics of crucial understanding. Before continuing it should be noted that I am involved within the zionist community largely through my membership in the socialist-zionist youth movement Habonim Dror. While I do have extensive knowledge of the Palestinian camp, I cannot claim to be completely even in my knowledge of Palestinian history and status, nor totally unbiased. However, I will try to do my best to be fair and honest in this blog. A map of Israel, the Palestinian territory of Gaza, the occupied Palestinian territory of the West Bank (occupied East Jerusalem not made clear in this map), and the occupied Golan heights (legally belonging to Syria). Israel is located in the southern Levant along the western shore of the Mediterranean sea and connects Africa to the Middle East. Israel and Palestine are two distinct political entities which have contested roughly the same area of land since the late 19th century. “Palestine” can be used to refer to the region itself as well as the political entity which represents the Palestinians, Israel specifically refers to the State of Israel. While both have comparable historical and legal claims to the land, however it is Israel that has become the dominant party. After the fall of the Ottoman Empire, the British seized control of the region as part of the Sykes-Picot agreement with the French and found themselves administering over two people with incompatible goals for statehood. For Israelis, their historical claim to the land is rooted in the Kingdom of Israel, as described in Jewish scripture, which is the Jewish ancestral homeland. After spending two millennia in exile suffering persecution and anti-antisemitism, the Zionist movement, founded in the late 19th century, brought about mass emigration of Jews to Palestine with the goal of establishing an independent Jewish state. Their legal claim to the land is rooted in the Balfour Declaration in which the British government proclaimed its support for the eventual creation of a Jewish state in Palestine. 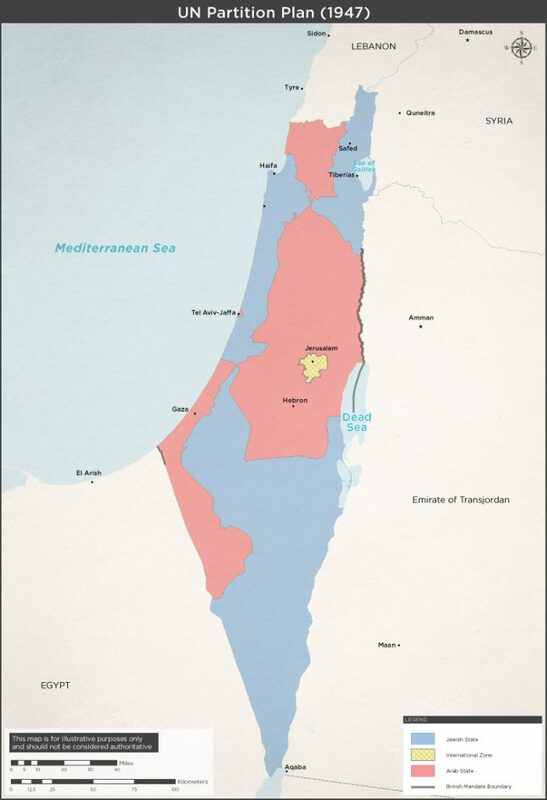 Furthermore UN General Assembly Resolution 181, passed in November 1947, which accepted a partitioned Jewish state (blue) alongside an Arab state (red) with an international Jerusalem (yellow) provided the legal basis for its formal establishment. For Palestinians their historical justification is basically having been in the land long before Zionism’s conception. Many Palestinians can trace back their ownership of tangible plots of land back many generations, something most Israelis cannot. Just as the British promised the Jews a state, in the McMahon-Hussein Correspondence, made between the British and the Sharif of Mecca, the British promised the establishment of Arab national independence, resulting in the awakening of Arab nationalism. They saw foreign Jews buying up land for their own national project as eating away at what should be their future sovereign territory and protested against it. And while Palestinian leadership rejected the Resolution 181 on these grounds, their right to an Arab independent state is no lesser than the Jews’. On March 14, 1948, the British evacuated and Israel declared independence. The next day, Egypt, Syria, Jordan, and Iraq sent forces to defeat Israel. Israel claimed victory and captured large portions of the land allocated by the UN for the Arab state, including West Jerusalem. 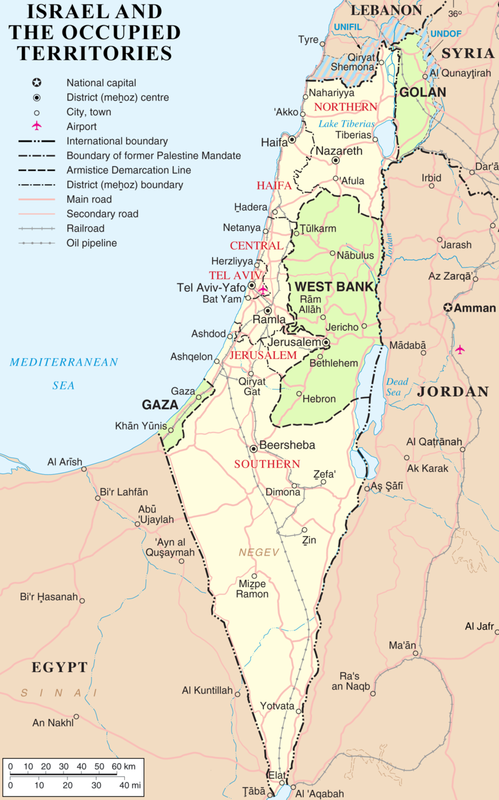 The majority of the Palestinian Arabs were forced to flee, many of which settled in the “West Bank” area west of the Jordan river, and the “Gaza Strip” southwest above the Negev. By the end of the war Jordan had annexed the West Bank and East Jerusalem and Egypt occupied Gaza, leaving the Palestinian Arabs without an independent state. The borders established in the 1949 Armistice agreement at the conclusion of the war (before 1967) came to be known as “The Green Line.” In 1967, in another war with its neighbors, Israel captured new territory including all of Jerusalem, the West Bank, and the Gaza strip. In response, the UN Security Council unanimously passed Resolution 242 determining that Israel’s acquisitions in the war were illegal and must withdraw from its newly acquired territories. UN Resolution 194 also proclaimed the right of return for Palestinian refugees to return to their homes which they were forced to flee. While in 2005 Israel pulled out of Gaza, however retaining control over its ports, airspace, and essential utilities, since 1967, Israel has illegally occupied the West Bank and East Jerusalem. The treatment of Palestinians in the occupied territories by Israel constitutes a modern human rights crisis reminiscent of apartheid. There have been dozens of UN Security Council and General Assembly resolutions condemning Israeli actions in the occupied territories. However, in this same time span, there have been waves of violent Palestinian uprising against Israel, including two “intifadas” which saw stabbings, shootings, and bus-bombings targeting innocent civilians. To many Israelis, this constitutes terrorism, and to many Palestinians, freedom-fighting. 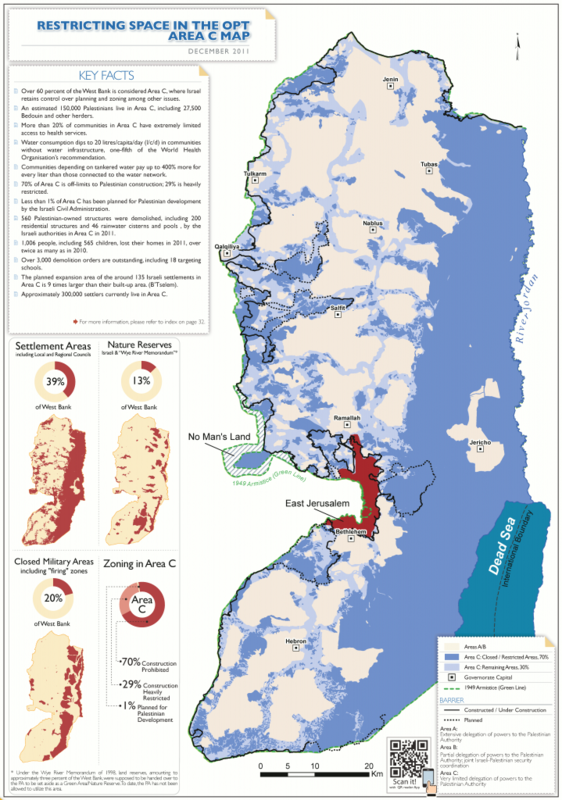 Settlements are government-sanctioned Israeli communities (mostly consisting of Jews) established outside the “green line.” Since 1967, Israel has been building and expanding settlements in the Occupied West Bank and East Jerusalem, with particularly rapid growth seen in recent decades. Israeli settlements are considered illegal by the international community according to numerous UN resolutions such as Security Council Resolution 2334 and Article 49 of the Geneva Conventions which states, “The Occupying Power shall not deport or transfer parts of its own civilian population into the territory it occupies.” The reason behind the international focus on the issue of settlements is due to their inherent incompatibility with a “two-state solution” the professed desired solution to the Israeli-Palestinian conflict by the UN. In a two-state solution, a Palestinian sovereign territory would most likely be established within the West Bank, including East Jerusalem as its capital as well as Gaza. Israeli settlements effectively undermine the viability of the establishment of a Palestinian state by splitting Palestinian territory, especially in locations where territorial continuity would be critical. Systems of government and demographics. I will try to keep this as brief as possible given the long explanation of the history of the conflict which is critical to understanding Israel/Palestine. Israel is a Parliamentary Democracy modeled after the UK system of government and is one of the most robust democracies in the region. Citizens vote for parties which take up a certain portion of the 120 seats in the Knesset depending on the number of votes. From there the party with the most votes must achieve a 60 seat majority (virtually always through forming a coalition with other parties). What this means is that even if a party wins a majority of votes, if it fails to achieve a coalition, the runner up has the chance to form a government. While in it’s earlier history, the leftist (now more centrist), Labor party maintained dominance, as the country shifted away from is more socialist economic foundations, its population began electing more centrist-and center-right governments starting in the late 1970’s. In the past decade the right wing Likud party has consistently secured dominance by forming reliable coalitions with the religious parties. The most important thing to understand about the Palestinian political climate is that it is strictly limited by Israeli military occupation. Even in Gaza, where Israel technically pulled out all its settlements and troops, it still maintains control over its borders, airspace, and crucial resources such as water and electricity. Founded in 1964 the Palestinian Liberation Organization had long been the main political representative of the Palestinian people, and has UN observer status. As part of the Oslo accords negotiated between former Israeli Prime Minister Yitzhak Rabin and PLO leader Yasser Arafat, the Palestinian Authority was created to administer Gaza and certain sections of the West Bank. The West Bank was split up into three kinds of Zones A,B, and C. Where A zones were completely governed by the PA, B where governance is shared between the PA and Israel, and C (the majority of the territory) where Israel has exclusive control. The Palestinians technically maintain a limited parliamentary democratic system, however it is currently defunct. While elections were held in 1996 that saw the party of Fatah claim control of the West Bank and Gaza, in 2006 the Islamist party of Hamas seized control of Gaza. Today Fatah controls the West Bank and Hamas Gaza. The two have engaged in numerous reconciliation talks to advance their common goals even as recently as last year, all of which have failed. Roughly 8.8 million people live in Israel. Roughly 75% are Jews of various backgrounds, 20% are Arabs. Until with the recent passage of the Nation State basic law, Arabic was an official national language alongside Hebrew (however now it is only Hebrew). Within its own Jewish population there are a variety of different groups with native born and those originating from Europe being the most predominant, followed by MENA countries, then the Americas. In the Palestinian territories, excluding the Jewish settlers, most of the people are Muslim Arabs (predominantly Sunni) with a significant Christian Arab minority. Arabic is the main language however English is made compulsory in schools, with many Palestinians knowing Hebrew as well. Roughly 2.16 million Palestinian Arabs live in the West Bank, 1.84 million live in Israel, and 1.79 million in Gaza. Sorry if this blog post is much longer than expected. However I hope that I have done a good job briefing you on the complex history of the region as I know it.